If you thought planning documents made great book ends, you haven’t been following the City of Tampa’s Department of Transportation and Stormwater Services. New bike lanes, sharrows, sidewalks, and complete street projects seem to be popping up all across town as they implement the City’s Walk-Bike Plans. Planners are already kicking off Phase 5 of the Tampa Walk-Bike Plan. The same goes for the exciting Invision Tampa plan. Focused along the Hillsborough River through downtown, communities of connected people and livable neighborhoods are being created. Also underway right now, is a conversion of the Cass and Tyler Street one-way pair into two-way streets. 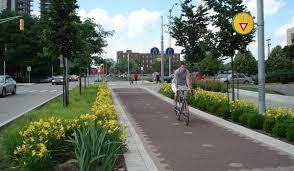 Inspired by the Indianapolis Cultural Trail pictured above, the design includes a barrier-separated, two-way, cycle track along Cass Street. This new configuration will help restore the street grid in downtown, while providing a safe connection for everyone all the way from the river to the edge of Ybor City. Cass Street will be the central piece of the east-west multi-purpose trail reaching westward to Armenia Avenue and beyond Ybor City to the east. These investments will position the City as one of the country’s most attractive places to open a business, raise a family, and maintain a high quality of life while preserving historic districts and neighborhood character. Questions or comments should be directed to Tampa’s UCAP hotline at 813/777-9222 or call Tricia Shuler at 813/281-7717.